I loved (loved) the first half of Climbing Days, Dan Richard’s journey in the footsteps of his great aunt, Dorothy (Dorothea) Pilley, and her husband I. A. Richards. These early chapters provide powerful insights into the life of a woman growing into adulthood in the 1920s, determined to be educated, to work, and to climb mountains, who found and married a kindred spirit in literary critic, academic and fellow mountaineer, Ivor Richards. The second half, from Switzerland on, infuriated me – Dan and his dad’s DIY ascent of the Dent Blanche, woefully ill prepared in kit, competence and communication. A weekend winter skills training course in the Cairngorms and he’s off attempting a 4000m peak, one of the highest in the Alps, that Dorothy and IAR only climbed having built up decades of experience, making the first ascent of the North Ridge together with Joseph Georges, their longstanding local guide, and his brother Antoine. Fair enough, the North Ridge is a much more difficult route*, but things don’t improve in subsequent chapters. A shame, Climbing Days was on track to be my book of the year. Instead, I’ve got a copy of Karen Stockham’s thesis Women’s Mountaineering Life-Writing 1808-1960, which Dan Richards credits in the Acknowledgements, thanking Dr Stockham for her “… knowledge and analysis of Dorothy’s diaries, notes and research so kindly shared, not to mention your thesis ..“, and ordered a copy of Dorothy Pilley’s own Climbing Days. UKClimbing article: Climbing Days – The Life and Climbs of Dorothy Pilley by Natalie Berry, September 2016. S or Wandfluegrat (Normal and easiest route, AD or BD). So this is not a climb for everybody. N or Col de la Dent Blanche (TD/TD+ or MD/MD+). Hello. A climbing friend who follows your site wrote to me tonight to say you’d reviewed the book — which is kind of you, thanks. I’m sorry you didn’t enjoy the second half. Of course you’re quite right, the first Dent Blanche attempt didn’t go very well in a lot of ways but in terms of how the story and trip went from there — meeting Dede and the others at La Sage, meeting Joan and Andre, discovering how my father’s life had intersected with Dorothea’s — indeed, how so many other people had interacted and loved being in her sphere, particularly towards the end of her life, perhaps that was the silver lining to the debacle. Having said that, we were always safe. My father is an excellent climber even if the fact he was 30 years older than when he climbed the Ferpècle Ridge came as something of a shock to him when we revisited the peak. A great deal of the book was told to take the reader smile, I’d always ridicule and send myself up before criticising others; but, as I say, if this didn’t come across and the second half didn’t work for you, I can only apologise. I’m not the best climber. First up, it’s really great to get an email from you – I’ve never had one from an author before! Thank you for taking the time and the trouble to get in touch. I did/do really love the first part of Climbing Days, and I would have loved to have read more about Dorothy Pilley. She sounds like a really amazing woman, who achieved much at a time when women’s lives were so restricted. In fact, I’ve bought a copy for my brother and my nephew, who are both more proficient climbers than I am, as a way into the life and times of both my / our mother and grandmother. 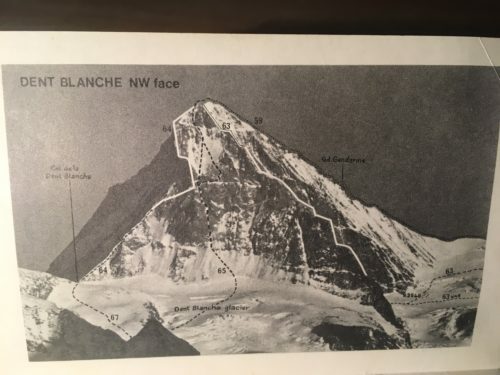 As I say in my blogpost I did struggle with the second half, because I wanted so much to learn more about Dorothy, and also because to me it didn’t sounds like you and your father were really well enough prepared for the first ascent of the Dent Blanche. I appreciate though that neither of you would have tried it without having made sure that you would be OK (as far as that’s ever possible) – that just didn’t come through clearly in the book. The blurb from Katharine Norbury on the back cover doesn’t help here either. I used to allow Comments on my website, but they got overwhelmed by spam (and Australian students whinging about having to study Tim Winton’s Cloudstreet for their exams!) and I don’t have them on this current incarnation. I would be very happy to update my blogpost page to add in a reply from you though, to balance things up. I meant to say last night how pleased I was that my book had led you back to Dorothea and Dr. Stockham. I’m delighted that you’ve sought out an original copy of D.’s memoir. It really is the most wonderful book. The cloth-covered 1935 Bell hardback edition is a thing of beauty and the 1965 reprint by Secker & Warburg is also great — the latter features a new foreword by D. which shows both her enduring love for the mountains and her extensive knowledge of the modern scene and climbers as was. Both to these editions have pages of amazing photographs too. Later editions by Hogarth Press and (print on demand chancers) Read Books don’t have any pictures and really don’t do the original book or Dorothea justice — I suspect she’d have hit the roof had she lived to see them. 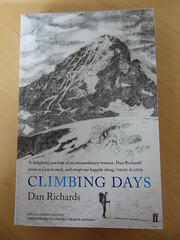 D.’s Climbing Days was the absolute source of everything; my total inspiration and way into the mountains, and she’s a superb writer; lyrical, warm, wry and fun. I really hope you enjoy it! Also, I’m so pleased you’re investigating Dr. Karen Stockham’s thesis about D. and her climbing cohort. Dr. Stockham’s writing is brilliant — she’s spent years researching the lives and archives of many amazing female mountaineers and that really shines out of her work. Added to this, she was so kind to me in the writing of my book, so generous and encouraging, so I’m glad you’re seeking her out. 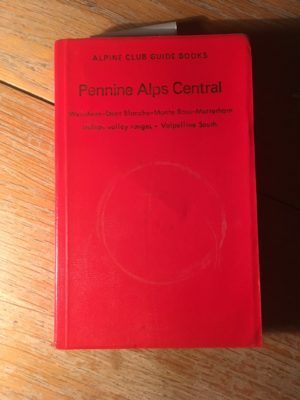 Regarding the Dent Blanche, below are a few pictures of the Alpine Club Guide Book from 1975 which my father, Tim, used to climb the Ferpècle Ridge with Pete Healey in July 1981 — No. 63 on the DB route map picture. 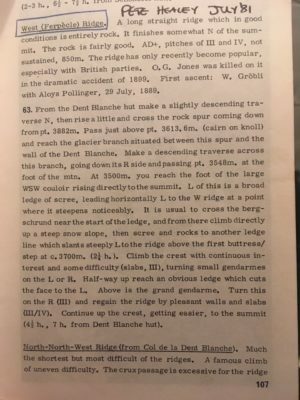 Dorothy and Ivor’s climb with the George brothers of 1928 – the NNW Ridge (No. 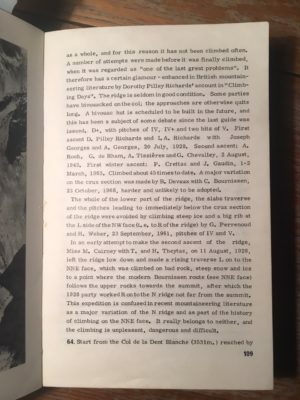 64) – is described in lovely detail from p.107 onwards and it was from the account on these pages that I found confirmation of the fact the route was indeed one of ‘the last great problems’ of the Pennine Alps — a phrase of Tim’s I remember from my childhood. 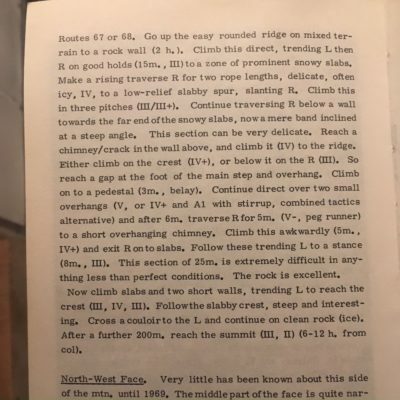 The fact that the route is referred to by D. and others as The North Arête is slightly confusing but I hope the pictures and text below help clarify things a bit. As far as Katherine Norbury’s quote and the perils of the first DB attempt, you’re quite right that we weren’t in good enough shape or properly up to speed for the mountain. But, if the first Swiss chapter falls down on that front (preparation and essential ability) hopefully it picks up points for good humour and narrative twists and turns. A Short Walk in the Hindu Kush has always been one of my favourite climbing books, along with The Ascent of Rum Doodle and it’s doubtless telling that they’re both farces — so Katherine wasn’t totally off track when she mentioned Jerome K. Jerome. The book was written in the hope of introducing people to Dorothea and enthusing them with the same joy and astonishment I felt having discovered that this amazing pioneering lady was part of my family and history. I hoped to bring everyone into my quest to go after her, climbers and non-climbers alike, and I wanted to make all parties laugh and marvel at my flailing game inadequacies and her astonishing adamantine abilities. Perhaps I played up one to burnish the other, I don’t know, but my father stands somewhere in the middle: an excellent climber with his own story — a sad but very well-meant and tender history of trying to engage with Dorothy and Ivor’s legacy. Writing books is a strange thing. I travel and research them, think them up and set them down and then send them out into the world and hope they find an audience/readership who’ll embrace them. Climbing Days was odd inasmuch as it was very close to home and far away in mountains at the same time. The climbing elements, the thing where I perhaps let myself down and you’re least happy reading about as a result, were the parts when I felt closest of Dorothea and the times when I really tried to do her legacy justice. I really wanted to connect with her legacy and I knew that I couldn’t be vicarious in that; I had to go and climb after her, engage with her mountains… and it didn’t all go well but I learnt a lot and I genuinely feel that the book would have been worse had I not gone. Of course, in retrospect, I’d have done a few things differently but spurred by Dorothea’s energy and immortal lines like ‘leaping crevasses in the dark, that’s how to live’, I went and I ventured — and then I went back and did it properly with Jean-Noel; for me, for Tim, for them. In terms of your site, I’m not sure what’s best regarding an addenda but it’s been very good to exchange emails with you. Perhaps this chain of three emails together with the pictures would be of interest to your blog readers? I’m sorry for such a delayed response – all the more so given the time and trouble you took with yours sent by return. It’s interesting that you enjoyed A Short Walk in the Hindu Kush, I didn’t! And I gave up on Rum Doodle too… which provides a pretty accurate reflection of my character: I’m a super organised, self sufficient, getting-things-done sort of person, and I’m not that into farce or comedy 🙂 But, descending into cliché, the world would be a much poorer place if we were all the same. I would like to add your first email, and perhaps the photos you sent too, to my blog post/review. I think it’s only fair to give you that place to reply. 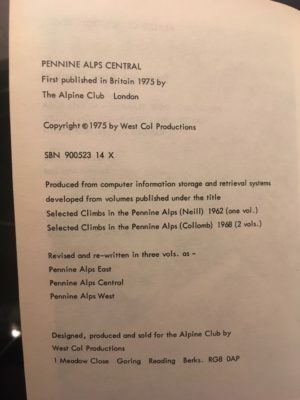 As you say, you and Tim were safe, and the second half of your Climbing Days does introduce readers to lovely people with connections to Dorothy and Ivor and “their” Alp; people who would otherwise remain relatively little known. 02 November 2017: Dan emailed me these wonderful photos of D.P., I.A.R. and some of The Pinnacles to add to this blogpost. He thinks the photos date from the late 1920s/early 1930s.